Soft, absorbent, luxurious terry towel material. Store your favorite book/Kindle, sunscreen, iPad, or anything else you'll need in the four generous back pockets. Slip the deep pocket over the back of your lounge chair (prevents towel from sliding down), spread it out over the chair's length, and enjoy the luxurious relaxation you deserve. 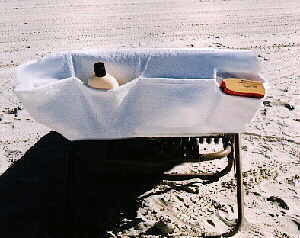 The Lounge Chair Towel can also be used as a beach towel layout. Use the pockets to keep your beach things out of sight. Machine washable 90% Cotton/10% Poly Material! It's the perfect cover for your lawn, deck, patio, and pool lounge chairs too! Lounge Chair Towel measures 30"x84". Bonus! White Mesh Totebag included!